One look at the saturated colours in Zachary Levi’s Shazam costume and you would have no doubt that DC has completely switched tracks with this one. In a way, it is the most “Marvel” movie DC has ever made. This comparison is obviously warranted since Marvel has over the years successfully been able to carve a niche for itself and the films in the MCU, and in the process, distinguished themselves from the vast clutter of superhero movies out there, even though it may have itself contributing to the clutter with close to three releases every year at its peak. DC may have stumbled in the beginning in finding its footing, but now seems to have found its heading in a direction wherein it will focus on individual stories more than future team-ups and setting up tentpole films. Following the success of ‘Aquaman’ last year when the film blew a storm across the ticket windows, DC’s latest offering ‘Shazam!’ offers little by way of universe building, but is a goofy little film on its own. For readers looking for a quick take on the film, it’s an absolutely harmless, no stakes comic book film; the kind of silly fun that the trailers promised? It’s all there. However, the bad news here is that the film never manages to rise above those low stakes and isn’t always as engaging, a frequent complaint I also had with a majority of the films set in the Marvel canon. Wait till the final section to read my full take on the film, but until then, we work on breaking down the ending, the most remarkable easter egg references, and the mid and post credits scenes for DC’s newest release, ‘Shazam!’. Since you are here, I am already assuming that you have seen the film and don’t care for spoilers. However, before delving into the ending, I would like to spend some time on establishing the Shazam mythos that is explored in the film. Although he is a relatively lesser known superhero among the standard DC lineup of superheroes, he regularly features in most of the newer publications set in the New 52 universe as part of the Justice League and other affiliations. Originally named Captain Marvel (yes! ), Shazam is the superhero alter ego of Billy Batson, a kid who is endowed with superhuman powers when he speaks the word “Shazam!”. The same is also the name of the wizard who actually endows Billy with those powers at the Rock of Eternity, the residing place of the wizard, chair of the council of seven, and also the source of both his, and Billy’s powers when he transforms into his superhero self. The name Shazam is the acronym of the names of gods Solomon, Hercules, Atlas, Zeus, Achilles and Mercury, with an essential power from each of them being bestowed upon the champion superhero. Thus, most of the characteristics of Shazam as a superhero stem from him basically being a kid inside an adult’s body, and while the film stays mostly true to the origins and roots of the character, it is those bits that are the absolute best ones in the film. The plot of ‘Shazam!’ has him square off against one of the character’s most revered enemies till date, Doctor Thaddeus Sivana. 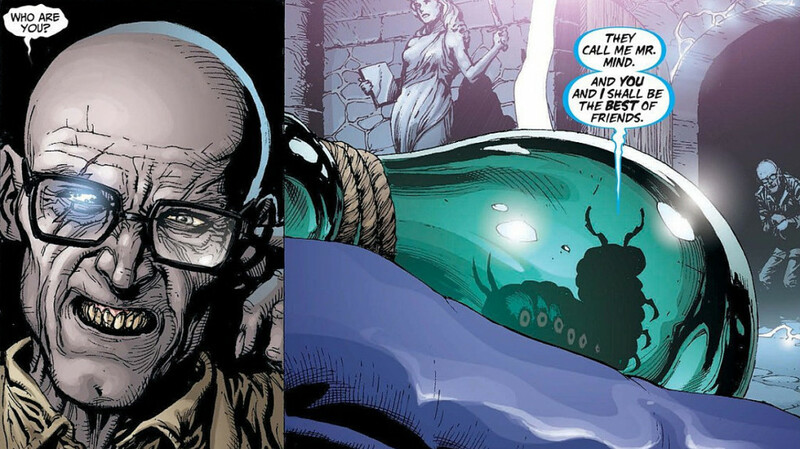 In the comics, Dr. Sivana is considered to be a mad scientist who wants to exact revenge on the world for shunning his ideas and inventions, and his attempts are obviously thwarted by Shazam (then Captain Marvel). 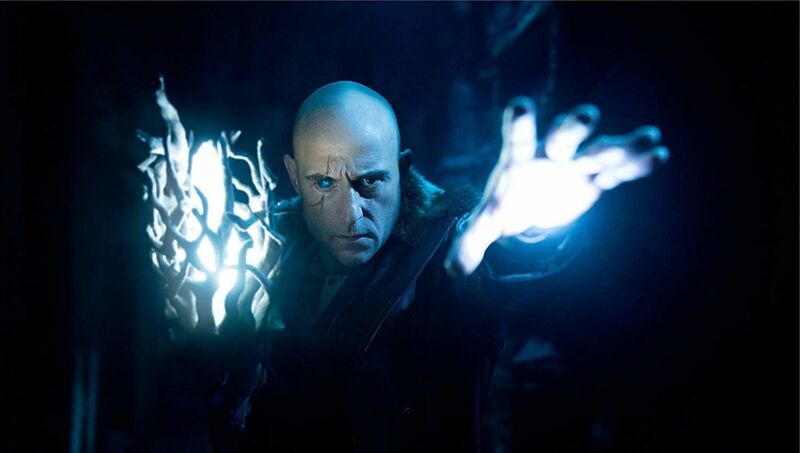 In the film, Sivana is shown as a child who suffered emotional abuse at the hands of his father and brother, and is summoned by the wizard Shazam for his choosing as champion. However, the wizard decides against it when he sees malice at his heart, and Sivana instead becomes obsessed with returning to the Rock of Eternity. When he does so following years of research, he steals the eye of envy and allies with the seven sins, who use him as a vessel to come out to the world. Coming to the ending of the film, we rewind our clocks to when Dr. Thaddeus Sivana along with the seven deadly sins attacks Shazam at the carnival, along with his foster siblings. While he tries to put up a fight against the twisted Sivana, he is finally forced to give in when six of the sins, Wrath, Gluttony, Lust, Greed, Pride and Sloth, excluding Envy, each capture one of Billy’s foster siblings. While Shazam initially seems to give in, he quickly overpowers Sivana to gain the wizard Shazam’s staff, also a conduit for the wizard’s powers to flow through him, and splits his powers with his siblings, who each utter Shazam at the same time upon his behest. It is at this moment filled with childish glee that the Shazam family (earlier called the Marvel family) makes its appearance, with Freddy transforming into Captain Marvel Jr. and Mary into Mary Shazam, along with Pedro, Eugene and Darla each transforming into adult superheroes with powers. 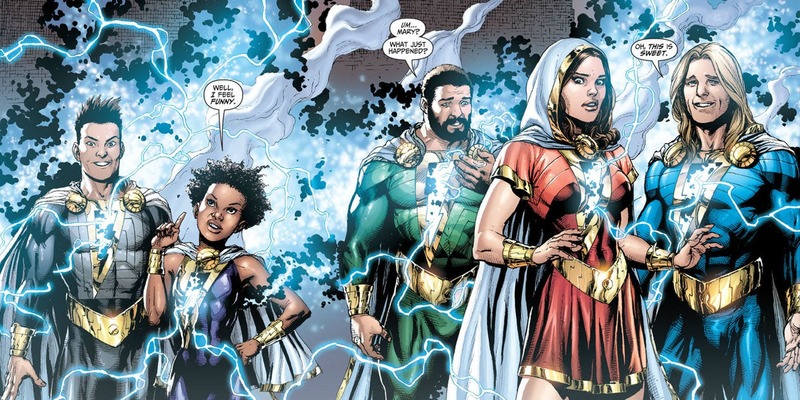 Akin to the comics, each member of the Shazam family (other than Shazam himself who would seem to be the epitomy of all those conglomerated powers) has one of the many abilities of the superhero vastly amplified. Darla for example has superspeed and is at par with other speedsters in the DC universe. Pedro is remarkably stronger than the other Shazams, and Eugene likewise has the ability of technopathy. While the Shazam family battles six of the seven sins, Shazam directly engages in a mid-air battle with Dr. Sivana himself. Knowing that Sivana would lose all his powers when the last sin in his body, envy, could be lured outside, Shazam taunts envy, calling him the runt out of the seven sins, and when confronted with the seventh and final sin, Envy, he utters Shazam while engaging with Envy, who disintegrates following being struck by the summoned lightning. With all the sins having left Sivana’s body, he is rendered powerless, and falls from the edge of a building, only to be saved by Shazam. The family is then cheered by the crowd as superheroes, as Billy comes to accept his foster home and family. Shazam then makes an appearance at their school to prove that Freddy was indeed friends with him from earlier on in the film, and brings along another friend, who turns out to be Superman. The film closes as Freddy exclaims, followed by one of the best credits I have seen in recent times, where Shazam is shown interacting with the other members of the league, in fun, quirkily drawn cartoons. One thing I absolutely love about the DCEU films is that short bit towards atleast the one third mark of the movie, wherein a character explains in voiceover, the origins of the film’s villain, and in doing so deep dives into a bit of shared DC mythos, that is legendary to say the least. These are presented in stunning 3D formations, making them all the more visually stunning. In ‘Man of Steel’, it was his Kryptonian descent and Zod’s motives explained to Kal aboard the Kryptonian scout ship. In ‘Wonder Woman’, it was the sequence in the beginning of the film wherein Hippolyta explains the origins of Ares, the god of war and the creation of Themyscira to a young Diana. In ‘Justice League’, we get to see a live action variant of the history of the Earth’s battle with Steppenwolf, equally visually stunning, wherein the Atlanteans, Humans and Amazons fought side by side to defeat the apocalyptic threat. In last year’s ‘Aquaman’, it was the history of the seven kingdoms and the power of king Atlan and his trident recreated in remarkable 3D, as told by Vulko to Arthur. The tradition continues in ‘Shazam!’ too, with the wizard Shazam explaining to Billy through magical golden particles originating from his staff when initially summoned from the subway, about a previous champion who the council misjudged, and one who used his powers for evil and destroyed the council of the seven. Casual viewers may misconstrue this vital piece of information as simply something that may have hinted to some ancient history, but the wizard Shazam is in fact here referring to Black Adam, the DC antihero and the singularly most well-known adversary of Shazam. The hooded figure shown in the animation, affirmatively Black Adam, touted to be played by Dwayne Johnson who along with his wife is also an executive producer for this film, was intended to make his cinematic debut alongside Shazam, but was later delayed to accommodate a standalone spinoff film for the character starring Johnson. Interestingly so, the character’s fictional history adds to the mythos, with Black Adam actually being an ancient Egyptian predecessor of Shazam with the same powers as him, and corrupted by them. Chosen by the council as their champion, he used his endowed powers for their destructive potential, ruling from the fictional country of Kahndaq, later being responsible for the fall of the council as well. His abilities too, stemming from the names of six Egyptian gods, Shu, Haru, Amon, Zehuti, Aton and Mehen, are acronyms for Shazam. Closely following Marvel’s formula of using the mid credits sequence to set up upcoming sequels, DC follows suit by introducing one of Shazam’s most iconic villains, Mister Mind. A captured Dr. Sivana is shown scribbling the symbols that led to the opening of the portal to the Rock of Eternity all over his prison walls. He is then taken aback when a machinised voice calls out to him, mocking his drawings as primitive and his knowledge of magic severely limited. To Sivana’s surprise, the voice comes out from a caterpillar like creature with a speaker like device secured around its neck. Fans may be able to recognise the creature to be another classic Shazam foe, Mister Mind, who believe it or not, is an evil mastermind well, caterpillar, as you read that the first time around. He proposes a mutually beneficial alliance with Sivana wherein he tells him of his plot to bring the pillars of evil together in an attempt to rule the seven realms, further increasing the significance of the number seven in the film and its plot. A more keen eye would be able to recall Mister Mind to be the same caterpillar who was imprisoned in a jar when young Thaddeus was summoned to the Rock of Eternity. However, when Billy is summoned by the wizard Shazam, the same jar is shown to be broken and the caterpillar, Mister Mind presumably escaped. 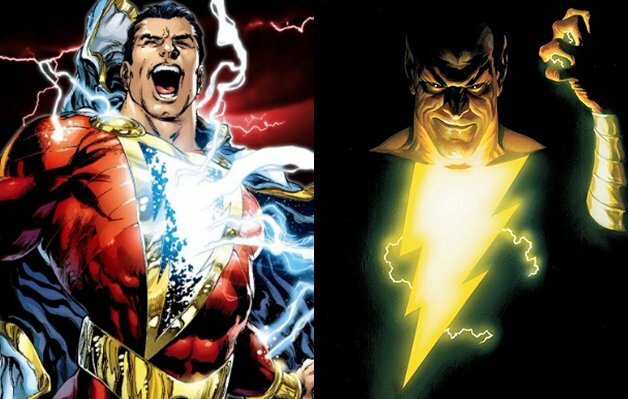 Neither the conditions of his escape, nor the way he was able to reach Sivana in his cell are given any explanation of sorts, but for now, fans can rejoice considering that they might get to see two of Shazam’s most iconic villains teaming up in the film’s sequel, when it happens. Yes, quite unusually for a DC movie, there is a second, post credits scene in ‘Shazam!’, and like its MCU counterparts, intends to do little more than a gag or a humorous bout. Likewise so, the scene begins with Shazam trying to interact with a fish in a bowl as Freddy watches, as part of testing out his abilities from earlier on in the film. Unable to do so, he asks if there is something cool he could do with that power. At this point, Freddy humorously retorts by citing Aquaman, stating that with that power, he could summon an underwater army of billions, a power Shazam immediately dismisses as stupid. 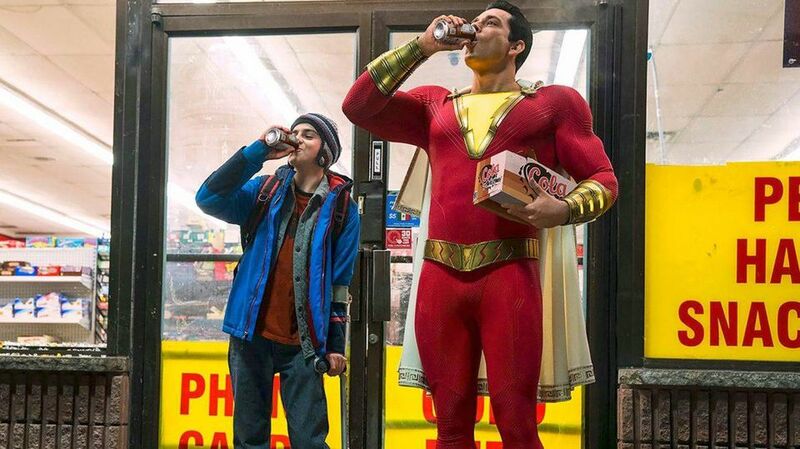 It was rather endearing to see a fellow DC film taking a jibe at one of its most successful characters and film outings to date, and while ‘Shazam!’ does precious little by way of universe building, little nods like these provide the film avenues to atleast link itself to a larger universe, feeling part of a bigger family, even if it isn’t necessarily about those characters, similar to the scene in the toy store with Batman toys or when a boy playfully collides his Superman and Batman action figures, while Sivana and Shazam battle it out in the background. There is little to no ambiguity when it comes to reviewing ‘Shazam!’. Everything that you may have come to expect from the film watching its trailers, ‘Shazam!’ is little else but that. It is nothing groundbreaking, and thankfully neither does it intend to be, doesn’t impress heroism and the power vs. responsibility debate quite too often. It is a film that akin to its titular superhero, refuses to take itself too seriously at any point in its 132 minute long runtime, a lesson DC may have learned from the perceived (and debatable) failure of its darker tone and representations. In that, is ‘Shazam!’ a saviour for the universe, that was breathed new life into with the credible release and successful box office run for ‘Aquaman’? Definitely not. But does it warrant a watch? Absolutely yes. The final virtue behind the verdict of the film as completely watchable wouldn’t lie in its ability to revive the DCEU, that already seems to be headed right on track, following the great response the ‘Joker’ teaser received three days ago, or add to the shared universes of these beloved characters. It is in fact a resultant of the great entertainment value that ‘Shazam!’ promises. The humour actually works and I found myself laughing out loud on quite a few instances. 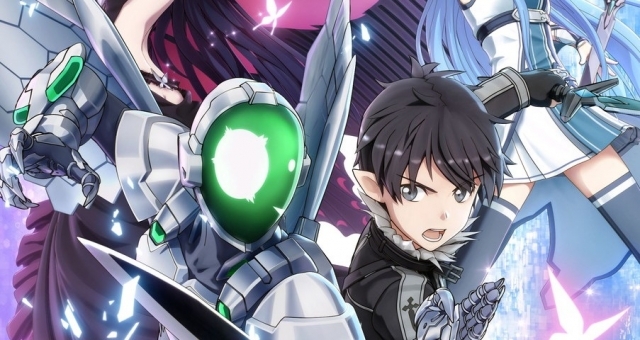 The film is buoyed with charming and affable performances from the entire cast, especially Levi, who appears to be having the time of his life playing a superhero who is essentially a kid inside. However, if there would be one person who could steal the thunder from his superpowered self, it would be Jack Dylan Grazer as Freddy Freeman, terrific in the comedic bits. While the low stakes feign viewer involvement after a certain point of time, and the mere serviceability of the plot adds to that, it is the humour that keeps the film going. 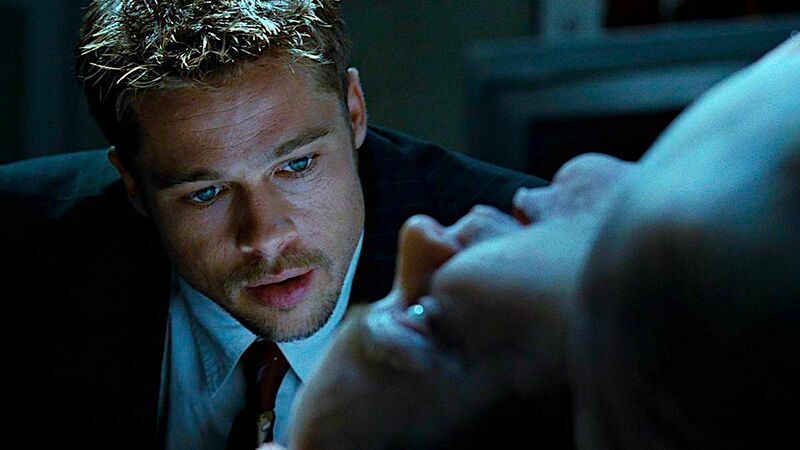 However, a film as such doesn’t come off without a fair bit of complaints as well. I can say this with confidence that it is the only DC film with not a single memorable action set piece. Eventhough the mid flight fight sequences are increasingly reminiscent of the ‘Man of Steel’ battles, they are nowhere near the artistry and hair rousing impact they had in the latter. The CGi too is way off at some points, which is somewhat understandable, given its rather short budget compared to other standard studio backed superhero outings. 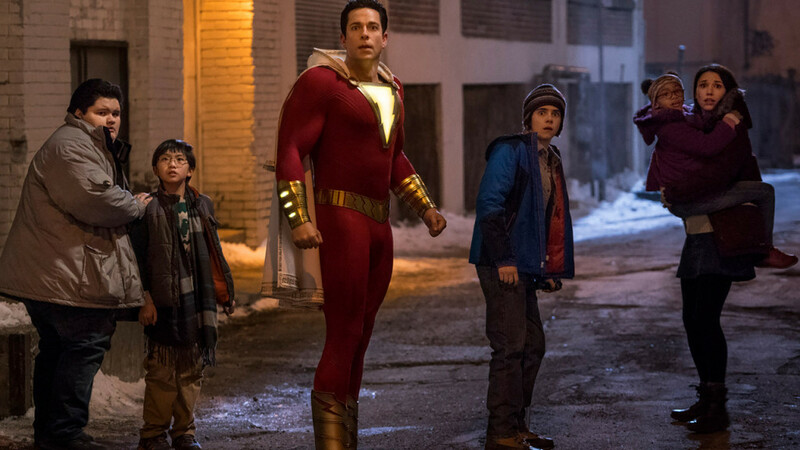 While the bits where Billy discovers his powers are absolutely delightful, the film quickly loses steam in the second half, only regaining once the Shazam family shows up, with the group too seemingly caught up in underwhelming action set pieces. It is fun while it lasts, but I honestly expected more out of the OG Captain Marvel. Certainly not the best that DC has to offer by miles, ‘Shazam!’ may be seen as a pitstop rather than the finish line. However, I’d be more than interested to see where this introduction of magic in the DCEU finally leads to.